While recovering from a small bit of flu in December 2006, I was beginning to wrestle with the prospect of turning my song cycle A Visit to William Blake’s Inn into a fully staged spectacle. The process I knew we would have to follow was one of great daring, originality, creativity, and more than likely, failure. 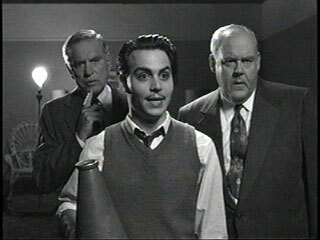 Looking to distract myself, I began looking through our shelf of videos and decided I needed to watch Tim Burton’s Ed Wood, a biopic of Hollywood’s worst film director ever, Edward D. Wood, Jr. As evidenced by his films (Glen or Glenda?, Bride of the Monster, and ultimately Plan 9 from Outer Space), Wood was a man of vision, energy, and absolutely no talent. His optimism was uncrushable, even in the face of overwhelming evidence to the contrary. Here was our patron saint, surely. I was inspired to write the following, and I intend to use it at the start of every major project I do, starting with William Blake’s Inn. Look over us now as we begin our new masterpiece. Blind us to the possibility of failure. Hide from us the improbability of our success. upon a good one every now and then. with an ever-rising and brilliant flood of success. now and in the hour of our rebirth.